The SonoSite Titan Veterinary ultrasound is engineered to meet the needs of most small and large veterinary clinics. This portable, lightweight, and battery-powered system is best known for its durability, ease of use, and efficiency. It’s able to go pretty much anywhere while offering optimal, high-quality images through its advanced imaging features, including Tissue Harmonic Imaging and Directional Color Power Doppler for extra image clarity. 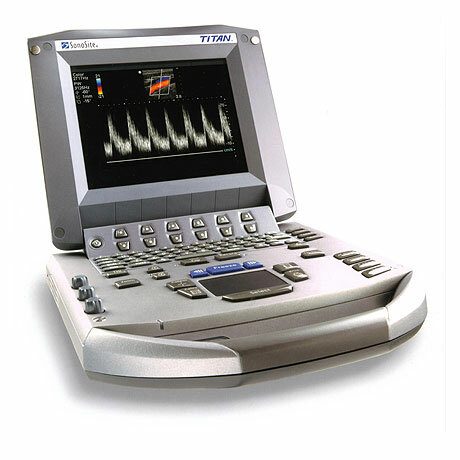 Furthermore, the Titan veterinary ultrasound uses transducers that range from 2-10 MHz. It has a linear rectal transducer for bovine and equine reproduction, as well as linear and microconvex transducers for large animal/farm animal abdominal imaging, cardiology, and equine sports medicine. The SonoSite Titan veterinary ultrasound has a modular design as well, which allows the user to set it up for stationary or mobile usage. There are a few key benefits of the used SonoSite Titan for the veterinarian. First, it’s very easy to use. Second, it boots from a powered-down state in 15-seconds. Third, the image quality is good for the price. Fourth, it’s durable. The refurbished Titan is an excellent choice the veterinarian looking to buy a portable ultrasound where speed and durability are key components of their buying decision. This is a good solution for emergency clinics as well.